Periodic Acid Schiff (PAS) staining is one of the most commonly performed special staining technique in histopathology laboratory which is used to highlight molecules with high percentage of carbohydrate content such as mucin, glycogen, fungi and basement membrane in skin. PAS method works by exposing the tissue to periodic acid. Periodic acid acts as oxidizing agent which oxidizes compounds having free hydroxyl group (-OH group) or amino/alkylamine group resulting in dialdehydes. These dialdehydes when exposed to Schiff’s reagent, an insoluble magenta colored complex is formed. A suitable basic stain is used as counter stain. Bring sections to distilled water. Treat with periodic acid for 5 minutes. Cover with Schiff’s reagent for 5-15 minutes. Counter stain with Herri’s hematoxylin for approximately 15 seconds. Differentiate (if necessary) with acid alcohol and bluing as usual. Clear in xylene and mount as usual. Formation of insoluble magenta colored complex denotes positive result. 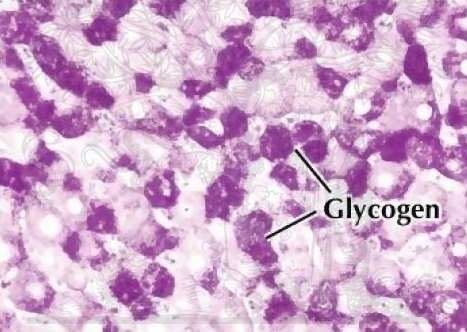 PAS stain is mainly used to highlight the molecules (structures) with high percentage of carbohydrate content such as glycogen, glycoproteins, and proteoglycans typically found in connective tissue, glycocalyx and basal laminae.